It all starts on the one-hundredth birthday of Allan Karlsson. Sitting quietly in his room in an old people’s home, he is waiting for the party he-never-wanted-anyway to begin. The Mayor is going to be there. The press is going to be there. But, as it turns out, Allan is not… Slowly but surely Allan climbs out of his bedroom window, into the flowerbed (in his slippers) and makes his getaway. And so begins his picaresque and unlikely journey involving criminals, several murders, a suitcase full of cash, and incompetent police. As his escapades unfold, we learn something of Allan’s earlier life in which – remarkably – he helped to make the atom bomb, became friends with American presidents, Russian tyrants, and Chinese leaders, and was a participant behind the scenes in many key events of the twentieth century. 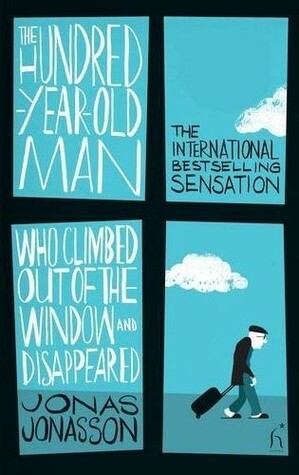 Already a huge best-seller across Europe, The Hundred-Year-Old Man Who Climbed Out of the Window and Disappeared is a fun and feel-good book for all ages. I first came across this book four years ago at the end of my work experience placement at Waterstones the summer after my first year at college, I have since finished my second year at college and three years at university so this book has been a long time coming for me. Part of the hold up for me was book guilt, as any Literature student will tell you, when doing a degree whenever you pick up a book to read recreationally you immediately get a sense of guilt as it is time you could be using to read your course texts. Course texts that you know are important, but that you also know won’t be as much fun as the book you’ve chosen for yourself purely for your own pleasure. The other source of my reluctance was my fear that I would be disappointed. Every time I picked up this book to enjoy and was overwhelmed by guilt I put it back down, time ticked by a year, another year, then it had been three years, then four that this book sat on my shelf promising humour and levity but I was scared that I wouldn’t be all that I had anticipated it would be and by this point there was a lot of anticipation. What initially drew me to this novel was the title. For a start, it’s not often that you get such a long title on a novel but the title itself tells you nothing but a fact, it’s about a 100 year old man who climbs out of a window and disappears. But in saying nothing but that you are immediately dragged into the mystique, you’re imagination immediately reels with the possibilities of the adventures he goes on. So having been drawn in by the title, I read the first page and then two random pages from the body of the text, I was hooked. That was all I needed! I distinctly remember, even after all this time, one of the pages that I turned two depicted the protagonist was breaking out of jail with explosives and a big ball of fire and I remember thinking ‘Yes, this is going to be hilarious’ and proceeded to recommend it to any who would listen. But after four years of waiting, I finally worked up the courage to see if I was right. I am happy to report that I was! It’s brilliant! Well worth waiting for! I’ve spoken to others who have read the book and reported it to be ‘okay’ or too fantastical but they’re wrong. Ordinarily I’d be diplomatic and say that all opinions are valid and different people would approach a narrative in different ways and therefore relate to the novel differently. Pish! In this case I will say I see no reason why anyone wouldn’t love this book. The Hundred Year Old Man is absolutely hilarious, so much so that it had me laughing out loud (literally) in public with people looking at me like I was insane but I couldn’t stop, I didn’t want to stop. The hilarity stems from the fact that it is fantastical, that is the beauty. It makes the ridiculous seem possible it a chain of seemingly fluke events that culminate in the best life you could possibly hope to live! Let me explain. The narrative is in two parts (which I’m discovering is one of my favourite styles), one tells Allen’s story after he climbs out of the window and the other tells his 100 year life story that leads him to the care home he has just liberated himself from. Both narratives however are equally ridiculous and wonderful. Throughout Allan’s life he saved Churchill, met Stalin, Chairman Moa (also rescuing his wife), Kim Il-Sung and comforted a young Kim Jong-Il. He helped Dr Oppenheimer, got drunk with (Vice) President Harry Truman and turned spy for the FBI. And those are just the big names! So it is not so had to believe that once he escapes the docile care home he manages to get himself caught up with the police, crooks, biker gangs and a very well trained elephant! It is well known that the best lies are based in truth and this novel exploits that fact to the best possible advantage, that is what makes Jonas Jonasson a genius. The beauty of this novel is that Allan has a finger in every historical pie of the last century but in a way that is integral but so innocuous that it would never have been mentioned. Jonasson weaves a version of history that would show that the most influential man to walk the earth would never have been a foot note even though every decision he made would have completely changed the course of history. I know that it seems like I’m being deliberately vague but to say anymore could potentially spoil the experience should you choose to pick up a copy and I would never want to deprive you of a single moment of surprise and awe. But it is not just Allen’s fantastical and, quite literally, awesome life that makes this novel. The supporting characters are equally brilliant and charming. I’m not even referring to the big names that we would all recognize but the friends that he makes along the way, Einstein’s half brother, a man who used up his and his brother’s inheritance studying at university for decades but never actually graduating, instead changing major at the last exam. The woman with a dog, a shot gun, a bus and an elephant who got lost having wandered off from the circus. Once you do, let me know what you think?